Graci‘s collections are by far one of our pure favourite during last years and our fashion blog ALALOSHA is a huge fan of Spanish design. 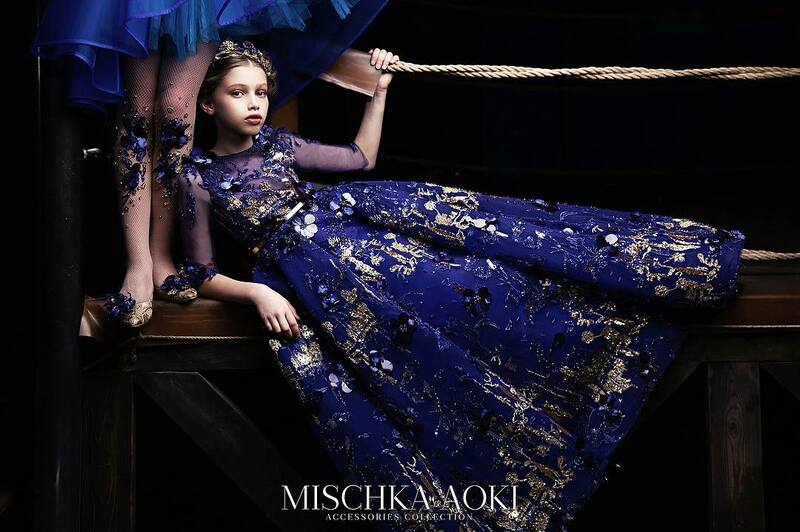 The new Fall-Winter 2017 collection is especially outstandingly beautiful! All of the looks are so extravagant, so feminine, so sensual, so bold! Those floral embroideries combined with delicate lace and luxurious silks.... Pure heaven! See the beauty that has come through our doors. Girls beautiful floral dress and brooch by Graci. This light and summery design features a silky satin overlay printed with a wonderful floral print of various summer blooms. The design has a fitted bodice with puffed short sleeves, with a full and gathered skirt, with tulle petticoats underneath, which add volume. The waistband is decorated with a lovely jewelled brooch and satin bow. There is a back zip fastening and satin sash that ties in a bow. It is fully lined in a cotton blend, with a longer-length tulle hem. Beautiful, silky, rich, burgundy red dress by Graci, with a black tulle overlay covered in sparkling red glitter. 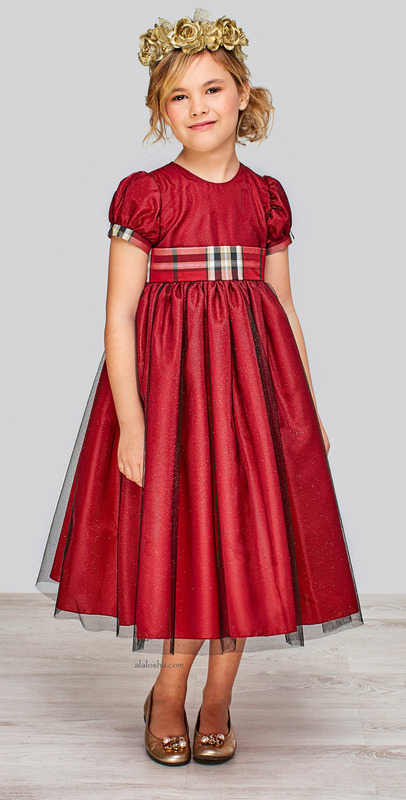 The dress has pretty puffed sleeves with a red and beige tartan trim, matching the wide sash around the waist, which ties in a large bow at the back. Fully lined in a cotton blend, with a tulle frill to give extra volume, it has an exposed gold zip fastener at the back, with a diamanté pull tab. Perfect for any special occasion, and would look fabulous with a burgundy red headband. 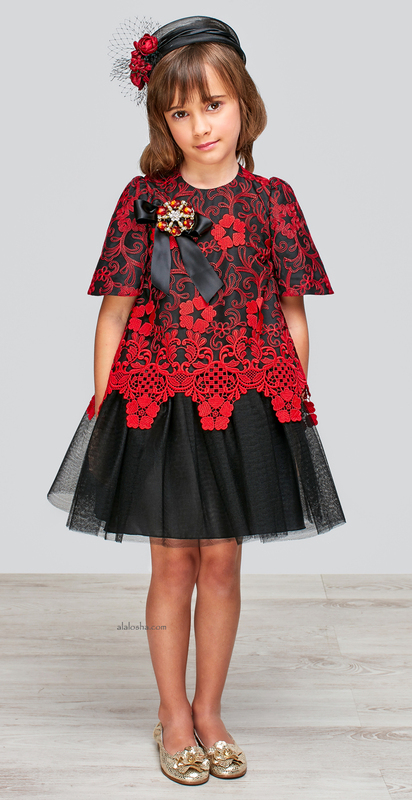 Girls striking red and black dress by Graci. The long bodice is made with pretty red lace over a silky fabric and flared sleeves. It has a stunning, detachable jewelled and ribbon brooch. With a dropped waist, the black flared skirt is made from layers of tulle over the silky fabric. The dress has a cotton blend lining with a tulle frill attached for extra volume and it fastens with a zip on the back. 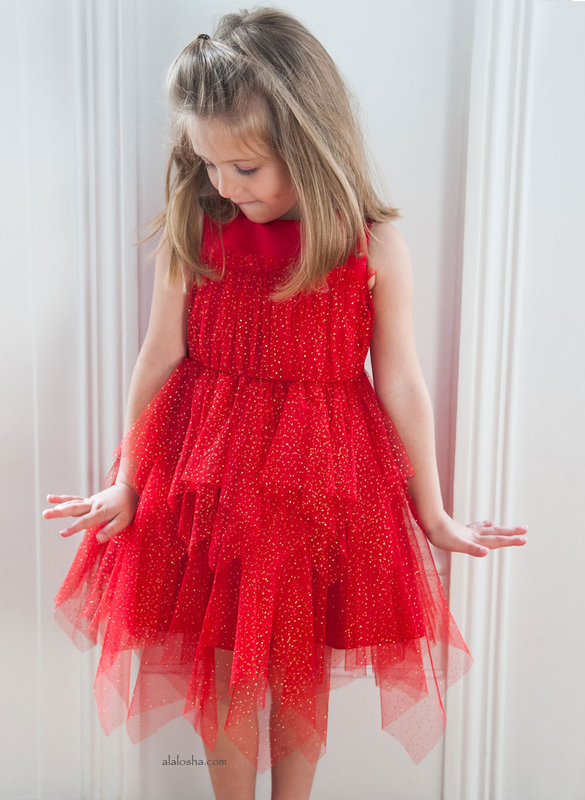 Girls white and red floral embroidered dress with red marabou feather trims on the sleeves by Graci. The fitted bodice fabric is made of soft cotton and the skirt has an overlay of tulle embroidered with rose detail. It has a red satin bow to fasten at the back. The smooth cotton lining has a tulle frill which adds volume and it fastens with a metallic gold zip at the back. 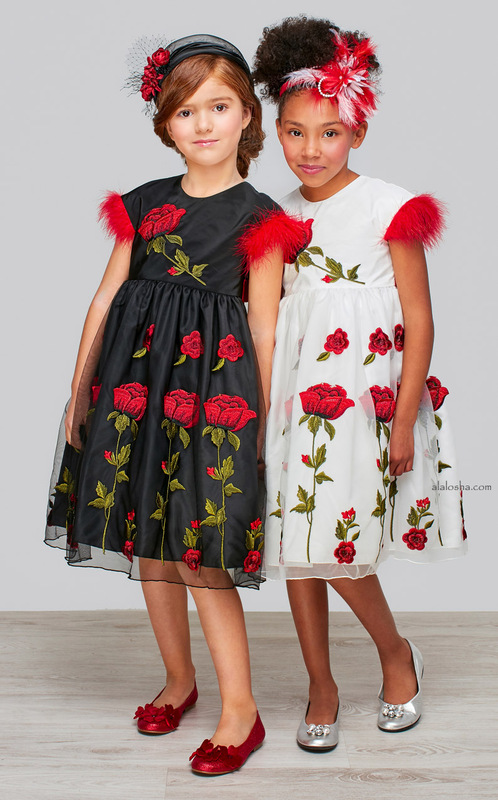 Girls black and red floral embroidered dress with red marabou feather trims on the sleeves by Graci. The fitted bodice fabric is made of soft cotton and the skirt has an overlay of tulle embroidered with rose detail. It has a red satin bow to fasten at the back. The smooth cotton lining has a tulle frill which adds volume and it fastens with a metallic gold zip at the back.